Trump averages a 'fake' insult every day. Really. We counted. President Trump has used the word "fake" more than 400 times since he was inaugurated. More than once a day, on average, he has publicly assailed "fake news," "fake polls," "fake media," and "fake stories." Over and over again, he has told the United States not to trust what reporters say. His allies have done the same thing. This repetition -- constantly labeling real news as "fake" -- is what has made the slur so powerful. In the run-up to the 2016 election, "fake news" was a term used by researchers and journalists to describe hoaxes that were designed to deceive people. These made-up stories are typically promoted via social media, either to make money or spread propaganda. But after Trump won the election, he almost single-handedly turned the definition on its head. Among his supporters, "fake news" is now a catch-all criticism for any news that Trump doesn't like. A study released on Tuesday by Gallup and the Knight Foundation found that "forty percent of Republicans say accurate news stories that cast a politician or political group in a negative light should 'always' be considered fake news." Press advocacy groups are trying to fight back against this perception. And two Republican critics of the president, Senators Jeff Flake and John McCain, are publicly chastising his constant use of "fake news." McCain called on Trump to stop attacking the press through an op-ed in Wednesday's Washington Post. And Flake delivered a blistering floor speech on the subject on Wednesday. "When a figure in power reflexively calls any press that doesn't suit him 'fake news,' it is that person who should be the figure of suspicion, not the press," Flake said. 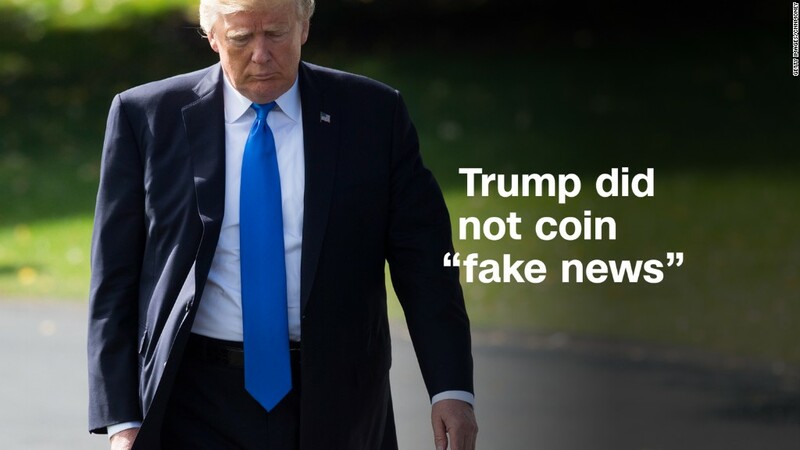 CNNMoney's analysis of Trump's "fake" talk was produced using Factba.se, a web site that compiles all of Trump's speeches, interviews, tweets from the president's account, as well as other publicly available information. It was corroborated through other research tools, including Twitter's search functions. Between January 20, 2017 and today, Trump has used the word "fake" at least 404 times in tweets and public appearances, sometimes more than once in the same sentence. He has used it like a slur, deriding individual news outlets and the news media as a whole. He has derided "fake news suppression polls" and "fake news hate shows." Recently he has applied the term to Michael Wolff's "Fire and Fury," calling it a "fake book." Past presidents from both parties have complained about biased and slanted stories. But with the word "fake," Trump has gone much further, asserting that journalists make up stories and implying that citizens can't believe anything they read. Once in a while, according to the Factba.se search, Trump has used the word in other ways -- like referring to Chuck Schumer's "fake tears." He occasionally called the Russia dossier "fake" and said the questions about possible collusion with Russia "fake." But it's almost always applied to the news media as an insult. This is still a relatively new development. Trump never talked about "fake news" on the campaign trail. He used the term only once in December 2016, and then really ramped it up in the days preceding his inauguration. "I've been hearing more and more about a thing called 'fake news' and they're talking about people that go and say all sorts of things," he said at a January 11, 2017 press conference. This was an early indication that Trump was taking the media industry conversation about made-up stories spread via social media and redefining it to suit his purposes. After his inauguration, he started saying that much of the national news media was "fake." It became a theme of his presidency.